Single-acting cylinders are the most universal hydraulic cylinders. They are used in many industries, often for very specific activities, entirely geared to the application. Single-acting hydraulic cylinders can apply force in one single direction due to a pressure build up of the oil; single-acting cylinders are used for lifting, pulling, holding or moving. The piston returns to its original positions by means of a spring (spring return) or the weight of the load (gravity return). Most hydraulic cylinders are made from steel, but there are also aluminium cylinders for those, who want to be able to easily move the cylinders. Single-acting cylinders are available in various capacities, ranging from 5 to 100 ton for the most commonly used cylinders. Single-acting cylinders are used for many building and industrial, maintenance and production applications. Laco rents and sells single-acting cylinders for all fields of application. 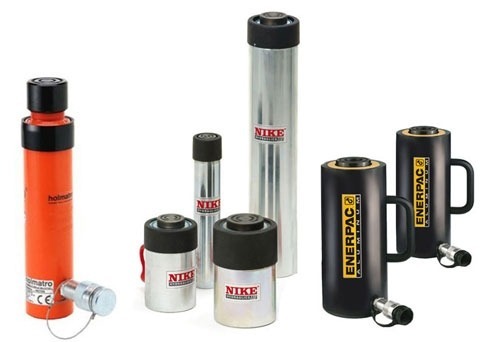 When selecting a hydraulic cylinder, you will have to keep a few things in mind; the required capacity, the application’s specific requirements and the combination of a cylinder with a pump and system components. A professional Laco advisor will help you make the right choice and will help you combine the rights parts and tools. Laco does not only have a large selection of cylinders, we moreover offer a flexible service. WHICH BRANDS AND TYPES OF SINGLE-ACTING HYDRAULIC CYLINDERS CAN YOU FIND AT LACO?